From snaggers on the barbie to dainty desserts for dames, Stew a Cockatoo is the cookbook that every Australian has been waiting for. Not only is this book jam-packed (no pun intended) with good ol' Aussie recipes but it's full of anecdotal stories about how our cuisine came to be and fair dinkum definitions for words and phrases like ‘bush tucker' and ‘spuds'. Bet you didn't know there were over 10 different types of Aussie sausage - beef snag, chook snag, pork snag, lamb snag, tofu snag, any kind of meat snag, sav, mystery bag and kanga banger. Recipes range from Damper with Cocky's Joy, to Lord Lamington's Lamingtons, and from Echidna Delight to Scrambled Googs. My favourite is the eponymous Stewed Cockatoo - I just hope young readers realise this particular recipe is actually a joke. But I think I might try the Roo Stew with Bush Tomatoes or the Prawn Skewers. All the recipes seem simple enough for children to follow with supervision. May has written this book, I imagine, with tongue firmly in her cheek. Both kids and adults will enjoy the humour. Kids are told they'll need an adult to help get "the jumbuck in the tuckerbag." May has also sprinkled interesting historical snippets throughout, along with activity suggestions. I've always enjoyed Hobbs' cartoons and illustrations. They're an excellent choice to add colour and a cackle of humour to these recipes. 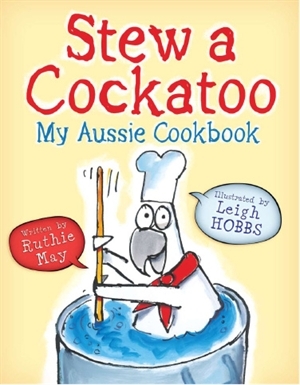 Illustration captions, text boxes, sticky notes, and the recipes themselves means Stew a Cockatoo is a perfect choice for parents, teachers and librarians who want to discuss aspects of visual literacy with their children and students. Stew a Cockatoo: My Aussie Cookbook would also make a perfect gift to send overseas, as it not only introduces kids to typical Aussie foods, but also to Aussie lingo - colourful expressions like "Arvo Tea", "anklebiter", "bikkies", and "Howya goin'?" Fun and practical! I hope you and your kids enjoy it as much as I did. Find more Children's Book Reviews on The Book Chook by clicking Reviews in the sidebar at right.